Nucor Corporation NUE plans to expand the production capability of its flat-rolled sheet steel mill, Nucor Steel Gallatin, which is based in Kentucky. The company’s board has approved $650-million investment for the same. The move will enhance the production capability of the plant to roughly 3,000,000 tons from 1,600,000 tons annually as well as boost the maximum coil width to around 73 inches. This expansion complements the $176-million investment to build a hot band continuous pickle galvanizing line at Nucor Steel Gallatin, which will produce roughly 500,000 tons of galvanized hot band steel per year. The galvanizing line is expected to be operational in the first half of 2019. Nucor continues to evaluate additional expansion projects as part of its actions to further grow its sheet business. This expansion project together with the new galvanizing line are in sync with Nucor’s strategy to achieve long-term profitable growth and increase its presence in the Midwest market, specifically in the automotive, heavy equipment, agriculture, as well as energy pipe and tube sectors. The project will allow the company to better serve its automotive and value-added customers. Shares of Nucor have gained 17.2% over a year, outperforming the industry’s growth of 3.1%. During the second-quarter call, Nucor stated that its third-quarter earnings are expected to improve on a sequential basis. Its steel mills unit’s performance is expected to remain strong in the quarter. The company also expects margins to expand at its sheet and plate mills. Based on the current steel market conditions, Nucor believes that there is sustainable strength in the steel end-use markets. In the second quarter, total steel mills shipments were up on a year-over-year basis. 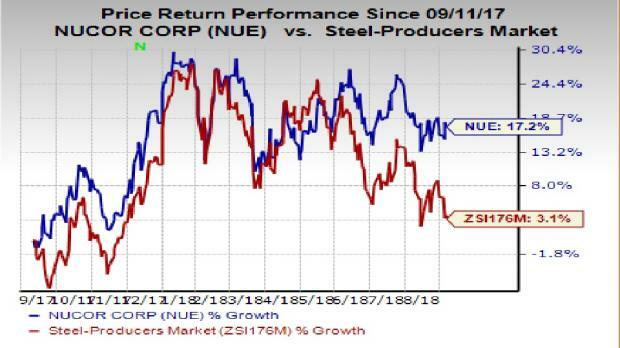 Nucor’s profitability in the steel mills segment also improved on a sequential basis. Higher average selling prices and increased profitability across all steel mill product groups were the primary factors driving the segment. It also witnessed strongest increase in profitability at its sheet mills. Nucor also anticipates third-quarter performance of its steel products segment to be similar to the second quarter. However, performance of its raw materials segment is expected to decline in the third quarter due to margin compression. The company is seeing continued momentum in the automotive market. Nucor has entered into a joint venture with JFE Steel Corporation of Japan to build and operate a plant in Mexico — which is expected to become operational in the second half of 2019 — that will supply sheet steel to the country’s growing automotive market. The company also remains committed to expand its production capabilities. Nucor has invested around $230 million to add an additional cold mill at Arkansas. The company is also investing $240 million in a new galvanizing line at its sheet mill in Arkansas that will have an annual capacity of around 500,000 tons and is expected to come online in the first half of 2021. Nucor is currently a Zacks Rank #3 (Hold) stock. Some better-ranked companies in the basic materials space are Huntsman Corporation HUN, Ingevity Corporation NGVT and Air Products and Chemicals, Inc. APD. Huntsman has an expected long-term earnings growth rate of 8.5% and sports a Zacks Rank #1 (Strong Buy). The company’s shares have gained 5.8% in the past year. You can see the complete list of today’s Zacks #1 Rank stocks here. Ingevity has an expected long-term earnings growth rate of 12% and flaunts a Zacks Rank #1. The company’s shares have rallied 62.5% in the past year. Air Products has an expected long-term earnings growth rate of 16.2% and a Zacks Rank #2 (Buy). The stock has gained 10.5% in a year’s time.